Understanding how our brains use past experience to interpret the world around us is super important when it comes to understanding how to integrate stimuli from our senses in business. We have all experienced a certain scent bringing back a memory. Today, I talk about the sense of smell and how awareness of it can help make your business better. [09:48] The sense of smell is made up of olfactory bulbs, which are part of the limbic system. [10:06] The sense of smell is one of our oldest senses, and it connects directly to memories and emotions. [10:17] It’s one of the first senses we use as infants, and it ties to certain emotions and memories by the time that we are five years old. [10:43] Our sense of smell developed through evolution to help our species survive. We can detect danger through our sense of smell, and we can find our children in the dark. [11:35] Molecules of items separate from the item in question (like bread baking) and those little pieces travel into our noses and are read by our olfactory epithelium (which are like the taste buds of our nose), sending a direct message to the brain. [11:55] Sight, sound and touch do NOT have this connection, so they are not as closely linked to memories or emotions. [12:19] Adult humans can distinguish between approximately 10,000 unique odors using 40 million different olfactory receptor neurons. [12:54] Because it has a direct route to the limbic system, certain scents can trigger fight or flight while others bring up vivid memories and others can make your mouth water. [13:27] Scent is also linked to physical attraction and our noses are trained to like people who are dissimilar to ourselves. [14:46] Smell is linked to where, when and why – thus the power of memories and really taking us back. [16:24] Being able to understand how these memories are formed and how to create positive associations can help with your business and customers. [16:47] Most of our scent memories are formed when we are around the age of five. [19:59] Scent marketing and scent logos are a thing. [22:02] Melina shares a story of how smelling Lush products made her hungry for P.F. Chang’s food. [22:53] ScentAir made grocery store sales go up by 7%. 83% of shoe shoppers preferred a floral scented room when shopping and valued the shoes at a higher price. [23:40] An experiment with scented slot machines. Casinos have branded scents. A gas station was able to increase coffee sales by 300% with coffee scented air. [25:08] Rosemary essential oil made test subjects perform tasks faster. [25:23] People can remember a scent and its related memory with 65% accuracy after 12 months. [25:47] An inhaled vanilla aroma decreased anxiety for 63% of MRI patients. 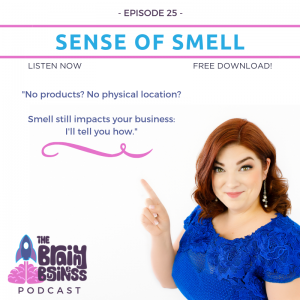 [26:42] If you have a physical location, the scent you infuse makes a huge difference and you want to make sure it ties in with your goals. [27:38] There are companies who are experts on scent branding. You can actually hire them to help you choose a scent for your business. [28:53] Scents are used to create an experience, and it will be a different experience for each business. [30:10] Bad scents can impact behavior and make it difficult to focus on anything else. [31:10] Our world and the way we think about it impacts everything we do. Our memories – and particular scents – can trigger emotions. [32:05] Even showing a picture of someone smelling something can trigger mirror neurons. [34:01] If you don’t sell food and you don’t have a physical location, it is still important to know the power of scent. You can use the power of sent to prime memories. Just be smart and intentional about it or things can backfire. [36:43] Next week on episode 26 we are diving into the sense of taste. How Does Scent Drive Human Behavior?